Many vegetables are well suited to grow in containers and an old bathtub is really just a large container. 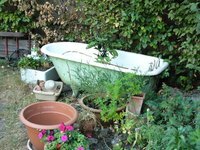 In fact, a bathtub is big enough to be turned into a small garden bed, where your vegetables can thrive without danger of being devoured by underground garden pests. All you need to do grow vegetables in a bathtub is place it in a sunny location, fill it with nutrient rich soil and ensure proper drainage. Place your bathtub in a location that will receive full sun. If you choose to bury the bathtub, dig a hole large enough to accommodate it and position it in the center, then backfill. Be sure to attach a PVC pipe to the bathtub drain to handle excess water and run it off underground into the surrounding soil. You may choose to leave the bathtub sitting above the soil surface, especially if it is an attractive old claw foot tub. This is less work for you and will still work adequately to grow your vegetables. Bathtubs that are not buried do not require the PVC pipe, just leave the bathtub drain hole open. Place a 1-inch layer of pea gravel in the bottom of the bathtub to improve drainage. Fill the bathtub with nutrient rich soil. A good mixture that will ensure proper drainage contains equal parts garden soil, compost, peat moss and builder’s sand. Plant your vegetables. A medium-sized bathtub will easily hold four or five tomato or squash plants, or three or four rows of carrots, beets or lettuce. You might also mix and match vegetables, interplanting carrots or lettuce in amongst the tomato plants, for example, to make the most of your bathtub garden space. Deep rooted and shallow rooted vegetables complement one another, or tall vegetables provide shade for shorter, cool crops. Water your vegetables thoroughly, so the soil is saturated, but not soggy, and wait for your vegetables to grow. Keep spoil consistently moist until plants are well established.